Golf Cart Transportation Go by paulbr75. 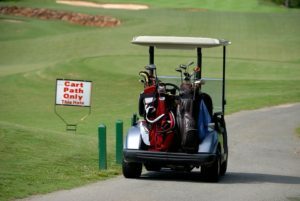 To the extent possible under law, the person who associated CC0 with Golf Cart Transportation Go has waived all copyright and related or neighboring rights to Golf Cart Transportation Go. Image Obtained from https://pixabay.com/en/golf-cart-transportation-golf-bags-1669772/. MadJax is one of our favorite suppliers of custom parts for golf carts. That’s why we include their full range of parts on our golf cart customization app, Build Your Golf Cart. In fact, we offer some of the best MadJax golf cart customizations available today. We’ve written about MadJax parts before, with a focus toward off-road golf cart use. We highlighted their universal mount winch, and how you can personalize your cargo arrangement to carry all your gear. We also put the spotlight on their excellent controllers, a prime selection of lift kits, and – perhaps their most outstanding feature – their light kits. It’s worth it to write about a few other places where a custom MadJax golf cart excels. Last time we focused on off-road golf cart use. This time let’s focus on golf carts used on the course and in other relaxing locations. MadJax makes some of the best and most durable flip-flop seat frames. A lot of flip-flop seating act pretty similar. They key is in the seating’s durability and east of use. MadJax keeps things simple so there aren’t extra parts getting in the way of your feet. They also build these frames to last, which makes them an excellent choice as a customization option. This is a great detail for a day out golfing. Folding footrests swing down so someone riding in back doesn’t have to dangle their feet. The advantage is in how quickly it folds back up again. It has quick-release drop pins for easy deployment, and you just have to fold it and re-pin it to secure it. This means it’s easier to store without having to un-attach the entire footrest, and there’s less risk of damage to the footrest. At the same time, it’s strong enough for riders to rest their feet while also giving space to accessories like a golf bag holder. MadJax has an excellent range of windshields and tints. This helps save your eyes as you’re jetting across the course or enjoying a ride through the park. They’ve also got a good eye for steering wheels These have nice feel, with a full range of designs. They know what a good steering wheel cover feels like, too. It’s funny, a steering wheel and its cover are such small details, yet you interact with them more than any other element of the golf cart. It can end up making a huge difference to a customer what their steering wheel cover looks and feels like. A golf cart can be perfect in every other way, but if the steering wheel doesn’t feel right in their hands, they’ll be much more hesitant to buy. Enclosures seem like a dime a dozen, but MadJax are much tighter to the vehicle than most. They have a better sense of fit and won’t get whipped up by the wind. There’s an eye for detail in their enclosures that really works well. A custom MadJax golf cart is pretty easy to achieve for a customer through a golf cart customization app. Build Your Golf Cart is subscription-based, which allows us to keep parts lists updated monthly. Not only that, but availability is also listed – this saves you from promising custom parts for golf carts to a customer only to find one is unavailable. It’s easy to avoid that these days, and not enough customization apps try. It makes easy sense for us to provide these kind of updates and information. It’s high time dealerships have access to these kinds of quality-of-industry improvements. Sell MORE — With Each Custom Golf Cart Built! Golf Cart Dealers — Setup In 1 Business Day!